14.06.2012 I forgot something in v2.2 – to avoid confusion i add another version v2.3 with support for mixed setup with calendars and lists in one page. 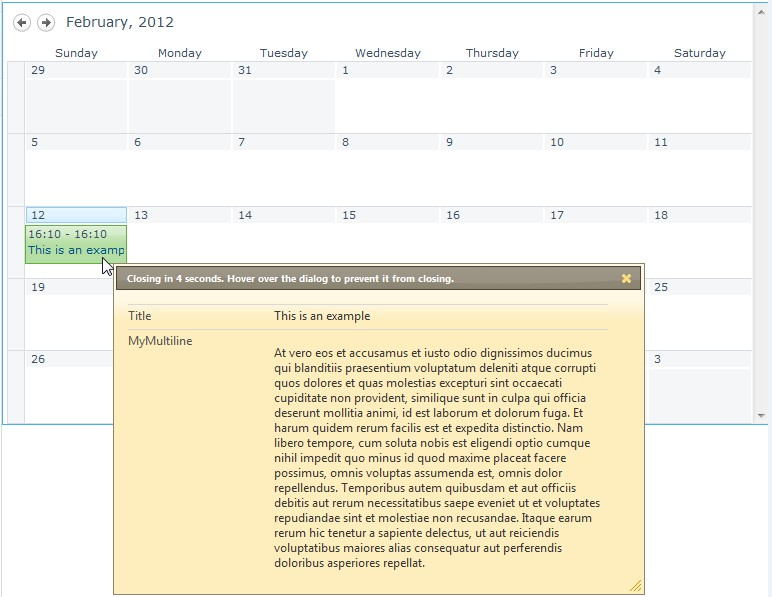 14.06.2012 v2.2 adds support for calendar day and week view, and adds an optional “Edit item” button. See updated CEWP code and description of the new “argObj parameters” below. 29.02.2012 v2.1. Fixed a bug when adding a document library view outside a document library. 14.02.2012 Fixed a missing </script> tag in the CEWP code example. Preview metadata in list view on mouseover and Preview metadata in list view on mouseover – updated version. Note that this one is for SharePoint 2010 only. This solution does the same as the previous solutions, but it is rewritten for SharePoint 2010 and is cleaner and simpler. 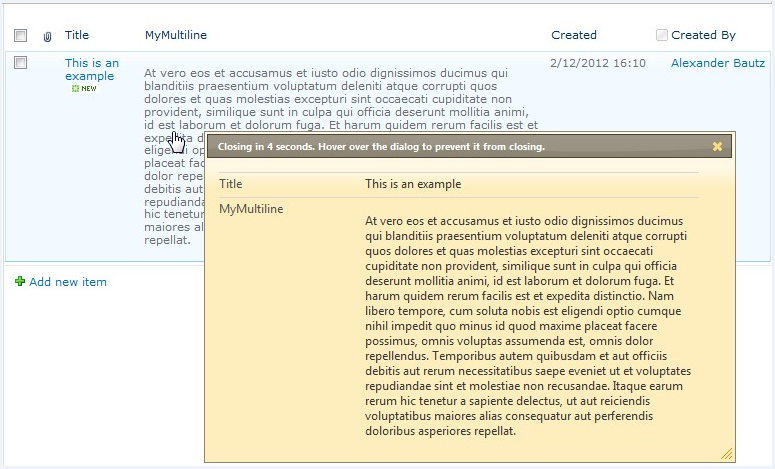 This solution uses the jQueryUI-widget “dialog” to show the preview. The theme used in the images is “sunny”. You can find all themes here. You can change the theme by pointing to another css-file in the CEWP code. You can have the preview trigger when you hover over the entire row, over one specific column, or over an image prepended or appended to a specific column. Download the file “PreviewItemOnHover.js” from here. 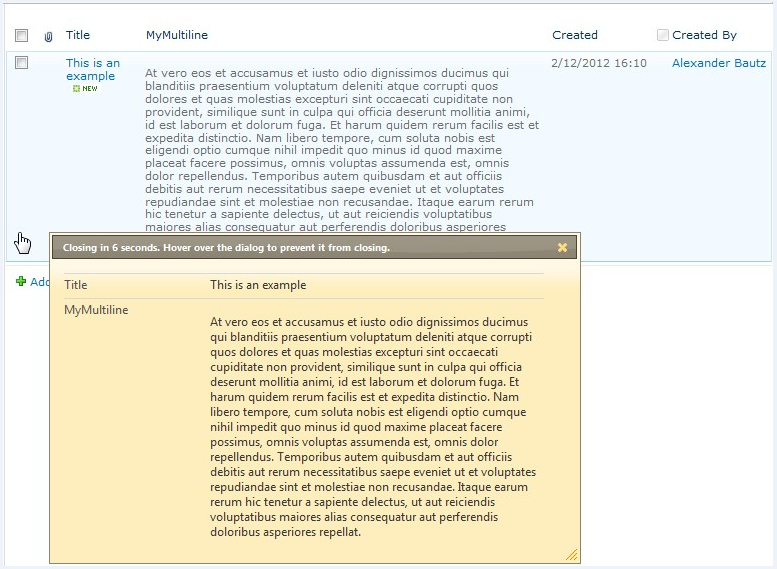 Upload the file to a document library, or a folder created using SharePoint designer. Change the script src to the file “PreviewItemOnHover.js” to reflect your local file location. Change the “argObj” in the function “init_preview” as described below. Place a CEWP in the page where you want the code to apply. Put this code in a text-file alongside the file “PreviewItemOnHover.js”, and refer it trough the content link option of the CEWP. arrOfFieldsToShow: If you do NOT want all fields to show, you can add all fields you want to show here, Note that if you add fields to this array, it’s ONLY those added here that will show. dlgWidth: The width of the preview dialog. timeout: The timeput before the dialog auto-closes in milliseconds (1000 = 1 second). autoCloseLabel: The dialog title with countdown (before hovering over it). hoverFirstTD: true or false. If true, the first column will be highlighted to indicate that it can be hovered. The style can be controlled in the style-tag in the CEWP code (td.hoverMe). hoverImg: true or false. If the above parameter is false, and this is true, use the next parameter “hoverImgSetup” to decide where to insert the image, and what image to insert. hoverTdIndex: The column index (0 is first column) from the left where the hoverImg will be added. prepend: true or false. Determines whether to append or prepend the image to the text in the target <td>. imgSrc: The url to the image to usee as “hoverImg”. btnText: The text on the edit item button. If both “hoverFirstTD” and “hoverImg” are false, hovering anywhere in the row will trigger a preview. If i have forgot something, please let me know by leaving a comment below. If you like the solution – buy me a beer! Tabular view > Allow individual item checkboxes is activated in the “Modify View settings”. What this setting does is to add the checkbox in front of the row. This solution depends upon this control to pick up the item ID. No error but no Preview as well. I pasted same code specified above after modifying the references with no luck then i specified one column name to arrOfFieldsToShow: but it did not work as well. I must be doing something terribly wrong if you can suggest something. Do you refer jQuery and jQueryUi from Google? – if so, do you have Internet access from your site? In IE: Hit f12 and look for errors while loading the page. You will have to verify the “src” to each file – it’s most likely an error in one or more. Alex, I verified once again that every src is referring correct file. If you still get nothing, send me some screenshots of the setup and I’ll see if I can spot the error. You find it in the top of the file “PreviewItemOnHover.js”. have you already found a solution for your issue? I was having a blank non-error pop-up, too. I finally figured it out. Read up on Jquery’s load() method and note how you can pass it a target selector so that it only imports a select amount of HTML into your DOM. Around line 118, he uses this .load() method to import html into the DOM, but, if your imported page does not feature an element matching his special selector: .ms-formtable, then ALL of your target HTML is vanished. I switched out this selector for #WebPartWPQ1 which is starting to get me somewhere. and it works fine with a Custom List. My next question: Does this work in the context of a Document Library? Hi Alexander, I passed the text. The script is running after adding a tag at the end of your CEWP Code. Can yopu please add a example behind your parameter descriptions, esp. for arrOfFieldsToShow ? I copied and pasted the code. I am able to find an empty pop-up with Edit button. But i am not able to find any of the column data. Can you please let me know what do i need to do to fix this. Its hard to tell. Do you see any errors in the developer console (hit F12 > Console)? In one of the below blogs i saw that this method does not support for Infopath items. So is there any way to use this method for the Infopath items? Sorry, but I cannot help with infopath forms. You can take a look at my DFFS solution, and possibly use this instead of your infopath form. The sunny theme can me downloaded separately from the “themes” tab, or you can select it in the download section where you downloaded jQueryUi. Thanks a lot, will do this later at home. Thank you for adding the closing tag and your explanations. How to close the pop up when the mouse was hovered over it? It did not disappear. When I try the upper right edge, it is closing, but I cant see a closing x there…is this may other css? OK, other css (lining to the external Ajax source) changes the color and makes the x visible. Changing the 2 to 4 for hoverTDindex should result in which behavior? Cant see a difference. At the moment the boxes pop up just when dragging the mouse somewhere at the page. “hoverTDindex” is used in conjunction with “hoverImg” and specifies in which column to add the image. If you either add “hoverFirstTD:true” or use a “hoverImg” you can control the preview” better. I’ll see if i can add a “hoverdelay” in the next release. Thank you for sharing the beautiful solution. Everything works fine except the hoverdelay. Do you have a fix for that? mhmm, bringing back the highlighted column (=true), the boxes didnt open when I am dragging the mouse somewhere, the box only appear when hovering the highlighted column…. Not sure what he means here. I don’t get the x in the upper right corner. I can close the pop-up from there but it just shows a square when you hover there. I’d like an ‘x’ to show up so the users know they can close this. This tool works great otherwise. Thank you very much. Can you make it work from within a Shared Documents web part? The match operation fails in that context. No, I do not think this is possible as this solution relies upon the “Tabular view” option in the list view settings – where you have a checkbox to the left of each line in the view. Is anyone having issues with the fields populating in IE8? I only get the box and header bar, no fields. When I switch to IE7 mode everything shows up perfectly. I do not have access to IE8 to test. I have tested it in IE8 mode in IE9 – and this works. If you find anything please post back and I’ll see what i can do. A box pops up when I hover over a calendar entry… I see a title bar and below that an area to display a description. I have Windows 7 64 bit SP1 installed, and am using IE8. I have not found a solution yet for IE8 or 9 yet. We have tested the old version, new version, reverted everything in SP back to out-of-the-box and still cannot get the fields to show in the overlay/pop-up. It works in IE7 so there needs to be some sort of browser script in the JS file to account for this and we haven’t had time to come up with something and test it. I’m sorry I cannot help here, but i cannot recreate this issue. If you find anything, or have a theory on what could cause this issue, please post back and I’ll try to sort it out. Works like a champ on a list, but doesn’t on a document library – is that expected behavior? Hi Walter. I’m having the same issue you had back in February–these popups work on lists but not my document library. You wouldn’t happen to recall what you did to make it work with the library? Thanks for any help you can offer (and sorry it is months later). I’m trying to display tooltip in calendar but I got an error: Object doesn’t support property or method ‘$7r_2’. Well, it seems your code is pre SP1. In SP1 the method $7r_2 has become $t_2 and this.$I_2.$7m should be this.$I_2.$7o. Really useful post! I do have one question….is it possible to get the edit button on the preview, to allow editing from there? No, it requires the 2010 UI. Hello, I’m having an issue where the page gets stuck with the “Loading Calendar…” box. I have the same problem as yours, I have different webpart on two pages,one with normal list view, and another with calendar view. The list view work perfect, but on calendar view, it stucking at “loading Calendar” do yo find the way to solve this problem? Hi, In IE: Press F12 to open the developer toolbar. Activete the console and reload the page. Does any errors occur here? Sorry for the late reply. I guess you find the answer in Mateusz Orłowski’s comment above. Hi, I have everything as per your instructions above but get ‘fUrl is undefined’ when I try to hover over the list item. I have both hoverImg and hoverFirstTD false. If I have a page have both list view and calendar view. how can modify this script? The Following fucntion actually does the bind hover function with the item. My solution might not as robust as the orginal one, and may cause some unknown problems, but it works specific for calendar view. Thanks the original author: Alexander again! See updated code for day and week support. Sorry, doesn’t work for me on an Announcements List. When opening your js file in VS 2012, I get many errors. Tried using anyway but no preview. Sorry for the late reply. I guess you have a wrong FieldInternalName. Is “Titel” supposed to be “Title”? This is a highly wanted feature for us. Thank you, Alexander for sharing this. This is for people who have issue with the pop up box without contents: I had the issue that the pop up box did not have any contents in SP 2010, no matter the browser is IE 7, 8 or 9. I found that my SP 2010 did not have the ms-formtable class. Once I added the class, it worked for the lists. To used it for my calendar, I have to modify PreviewItemOnHover.js a little bit. Now it works for IE 7, 8 and 9. I tried SP 2007 too. It worked immediately for IE 7 but IE 8 did not have contents in the box. Since SP 2007 is not where I want ot put it, I did not spend much time with it. -What is the content of that class? Internet search info is conflicting and doesn’t seem to apply. Any guidance you can provide would be greatly appreciated. Scott, sorry for the delayed reply. I have not revisited this site for a long time. What you need to do is only opening the DispForm.aspx in SPD and adding ms-formtable class to the table holding your item detail content. In case this solution interferes with other functionality, you may make a copy of DispForm.aspx and name it something like DispForm2.aspx, make the change there and have the hover over call DispForm2.aspx. This approach need to modify Alexander’s code a little bit. Most likely you do not have to do this. Alexander, have you tried this on calendar overlays? It seems not working with overlayed event items. I need make it work on overlayed items, can you give some help or suggestions? Please do not mind. I get it work with calendar overlay. It was my fault. Get the dialog delayed to pop up too with some modification. Just thought I’d throw this out there for anyone having troubles with the following: “Object [object Object] has no method ‘dialog'”. The version of jquery on the master was taking precedence and obviously didn’t have the dialog function. Add the following to the top of the PreviewItemOnHover.js and it fixes it right up. Save and it’s good to go. To increase the time needed to hover, open the jquery.hoverIntent.js file and just adjust the interval (ln 35). It worked charm for for announcements list view webpart.thank you for the post!!!! Great post. This works well for internal lists and calendars. However, is there a way to get this to work with external lists? Thank you for this solution. This feature is exactly what I need. Would you be able to help with two issues? I have a page with a few document libraries and a calendar. 3) the calendar item continues to show up when I return to the library items. Not empty anymore; just the wrong content. I’m guessing it’s cached until it is replaced by new content? I’ve checked that I have the right FieldInternalNames for the document library. I also tested this on a page with no calendar, which still gives me empty popup boxes. Thank you for any guidance you can provide. I reread my post and realized it was misleading: I note two issues, and then list three sequential steps those two issues appear in. At any rate, I got the popups to work in my document libraries when I use the first tr to hover on. Strangely, what remains is that after an initial hover when the field content populates correctly, the rest of the popup boxes are either empty or populate from another previously hovered box. 2) the first url constructed pulls the right list/row id, but for some reason subsequent urls are just not being picked up. Any thoughts on what I could do to address this? I have tried to investigate this problem before, but have had no luck as I do not get these errors on my setup. If you can provide me with he URL you are being redirected to when you get the 404 it might help (right click the dialog and select properties to get the URL). If you also could send me some screenshots of a test setup – clean, with no other scripts interfering. Even better would be if I could get access to the site with the error. As a test before I saw your note, I tried your previous script for (Preview Metadata in list view on mouseover) and it both works perfectly and fits my requirement better (a simple tooltip with data from just one of the form’s fields). Thank you for these powerful tools, and your generous help with their application in what must be a variety of environments. If you’re ever in New York, I’d be happy to buy you a real beer! This is really great post and worked for me. This is absolutely working fine for list view. I need hover functionality in a list input screen.What all changes I need to make here? This is great! thanks for sharing it. I just used it on a web part page under one list that I wanted to preview. However once the script is on the page, all the list web parts allow me to hover over them which is not what I really want. Is it possible to specify which web part to apply to? i need to close the popup automatically when mouse out. You have to dig into the script searching for “DispForm.aspx” and edit the link there. when i changed DispForm.aspx to my Custom Page nothing happened. Note: DispForm.aspx exist in 2 lines (151,64) and i changed both of them. I’m sorry, but it’s nearly impossible for me to support custom forms as the varieties are endless. I hope you figure it out by some trial and error. but not working you have any solution for this? This option is not available in this release, sorry. You can make your own modification around line 121 in the code. 1 issues – I have a Document Library view showing 5-7 documents, the preview changes each time I hover in and out over them. But when I visit the last one it seem to store it in memory and then if I scroll over any other in the list it always show the values from the last update ( if this makes sense) the only way to clear it is refresh the page (F5) and then it works fine – till I hover over the last row. any suggestions on how to fix this ? 1query- Can I hide the field labels from the dialog ? – is so where do I change / hide the code please ? Had an issue where the popup was blank for a calendar view, but populated properly for a list view of the same list. After much head scratching, I discovered that it was due to the DispForm url. For some reason, the list view link was “/lists/my%20calendar/dispform.aspx?ID=1” whereas the calendar view had it as “/lists/my calendar/dispform.aspx?ID=1” – i.e., the list view has properly encoded the space and the calendar view hadn’t. Fixed by altering line 118. I tried using encodeURI(url) but that broke it for the list view by encoding the “%20” to “%2520” – i.e., it unhelpfully encoded the “%” symbol as “%25” ! Thanks for this update, I hope this will help others experiencing the same problem. First off, thank you for making your code available. This works very well and is a handy little plugin! (b) has controls that don’t expand to the width. Do you know how or resources who can help me render these in a more “pleasing” way? Tool-tip is working fine for me with calendar when be signed in, but my problem now when sign out the Tool-tip is empty although the page and js file is approved. This a wonderful tooltip that I have ever used. I fulfills all the requirements that tooltips need to have. However I have stumbled across a very strange problem. As far as I can remember, you cannot have two “hover actions” in the same view. This is something I wanted and is very helpful for me. You done great job mate! Kindly note that this works perfectly. You also check for spaces or Underscore characters in your field name. Thank you for the feedback – I’m glad you liked it. If you put your field in the “arrOfFieldsToShow” in the “argObj” you should get a single field in the dialog. The order is given from the default order in the list settings. Looks like a wonderfull script but doesn’t work 100% on my site. The dialog box gets populated when I use hoverFirstTD:true, but when I set it to false, I can hover but the dialog box is empty? 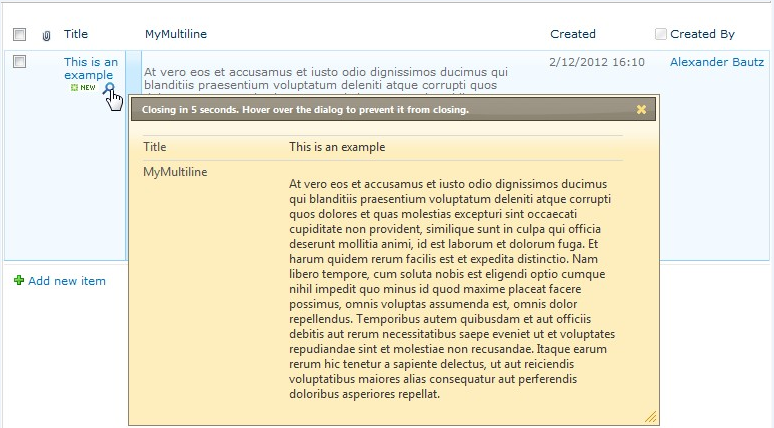 Also, the SharePoint ribbon gets **** up using this script. The library tools are gone. This is a great post and I have tried it successfully. But now the problem is I want to use custom display form rather than default. So pls guide me what to do for that. On my page, when I close the pop up box for one item, then hover over to another item, the pop up box displays information for the previous item which I previously closed.. Anyone else have problems with this? Is this not supported anymore? I used to use this and it worked fine but now I notice that only a blank dialog appears, not fields can be inerted using arrOfFieldsToShow:[‘Title’,’Details’], (or blank). A great and simple tool to use but I’m not sure if it will still work. Thanks so much. Have something changed in your setup? – either in your SharePoint farm or maybe you have changed browser? Is there a rule to place the content editor webpart right above or below the list web part? I have added all the js /css files in my website and linked to the same. I pasted the entire code in the CEWP on the same page but there is no popup. This is resulting in an error “Object does not support preoperty or method in PreviewItemOnHover.js file in Line 149,157 and 162. Something to do with #tempwrapper? I must be doing something extremely wrong somewhere…. how apply this script in Data form Web Part? In custom view multiple item form. Sorry, but his solution supports standard list views only. Sorry, but this solution will not work with InfoPath forms. Is there any way to get this feature for the Infopath forms as well? Sorry, I cannot help you with infopath. Great solution, however I have one question: is there a way to exclude one column from the preview? In my list I have a column with a hyperlink, and don’t want it to be displayed in the pop-up. Fantastic code ! thanks a lot Alexander for sharing. Works like a charm. (but as IT guys and Users are never happy ! 😉 > it would be perfect with half or 1s delay before displaying the pop-up). This worked for my Calendar but other users are not able to see the hover over like I am able to see. Do you know why? Could it be that the scripts are located in a place the other users cannot access? If you have the scripts in a document library you must ensure all users have read access to it. Does this solution work on SP 2013? No, you should follow the link to the latest solution in the top of this article. hi, i have a question. this solution works in document library with word documents, excel documents, pdf file? This is for previewing metadata and not the file itself. do you have some solution for my problem, some link etc? Sorry, but I do not know if any solution like this. I’m sorry, but if you do not get any errors in the developer console (F12 > Console) there is little to go with as I cannot reproduce the error. Thanks for a great solution. Will it be possible for the popup to show the details of a lookup column. I have a related item column and I would like to show the details of the related item rather than the item in the current list. Sorry, this is not supported. Thanks for your code for previewing item on hover. It worked pretty fine in IE 7. But its not working in Windows 7, IE 9 browser. You should test the new version linked in the top of the page. Any idea how to get this to work on overlay calendar view? the box shows on hover but its ocntents are empty? is it to do with the way my overlay is setup? Sorry, but I have not tested this. Calendars are a bit tricky as there is a lot of asynchronous updates. i noticed that someone else (about halfway through this comments list) asked the same question but managed to resolve it without giving a resolution on here……. I hope you still monitor this. I love this have not seen anything out there that works like this. I have two Columns Title and Description But when I put the code in a CEWP the hover goes to the Tubular box and not on Title when I put hoverFirstTD:false, it puts my Image on the Description column. So I have to put a Blank Column in for the image to show on the Title. Also I would like only the title to be in the Web-Part and when hover show the Title and Description is this possible? in other words I want to hide all columns in Web part but Title. But still show Title and Description when Hover. If you set “hoverFirstTD” to false and uses “hoverImg”, you can target the correct cell (the Title column) by changing the “hoverTdIndex” to 1. I don’t want to use image, The hover needs to be done with column 9. This Post is really awesome. It is giving me the exact solution, but I need one more thing to be done with my site. Here, you have shown solution for hovering on 1st column, image, entire row, etc. But what I need is, I need to hover on 9th column. It needs to display value from other column. Which part of code should i need to change, to make hovering on 9th column? Is it possible to make Hover on 3 columns? This will target the 9’th td. If you want to have the hover over multiple columns or want to change the code, you are welcome to do this, but unfortunately I cannot do it for you. If you use true or false, this is case sensitive. Is this works for sharepoint online. As I am getting only field names without any value. Please help me if there is anything for sharepoint online. As I wrote in the comment above yours: it’s not tested in SP 2013 – use the one I linked to in the comment.